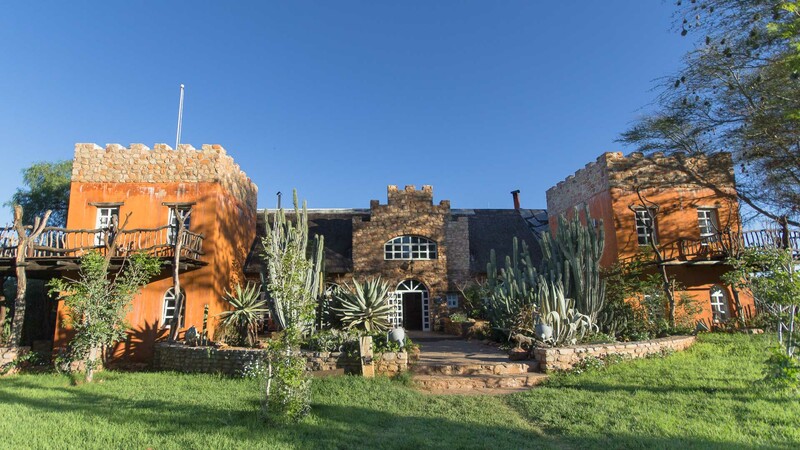 The Okambara Elephant Lodge is situated on hour east of Windhoek about 1600 m above sea level in the middle of the Okambara mountains. 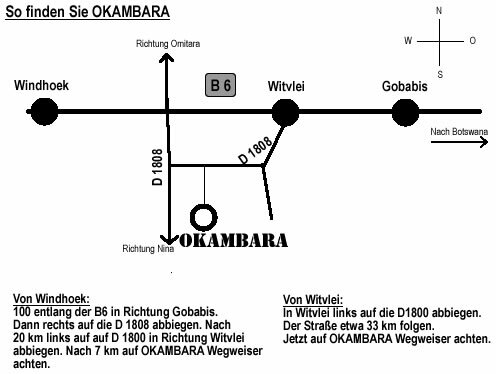 To get from Okambara to Windhoeks city center will take you about 1,5 hours (Site Map). 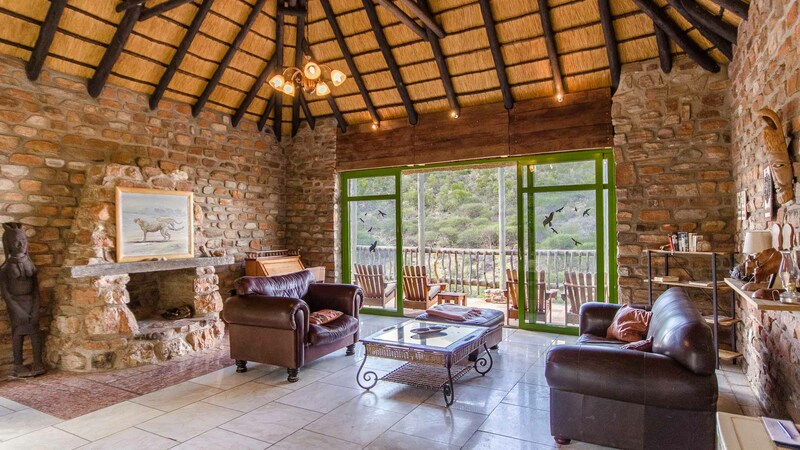 You can choose between one of the 5 comfortable apartments in the main building, from one of the two typical rondavels (bungalows) or you can also stay in the Mountain House and enjoy the stunning view from its balcony. The lodge ist a proper family business run by family Schmitt. 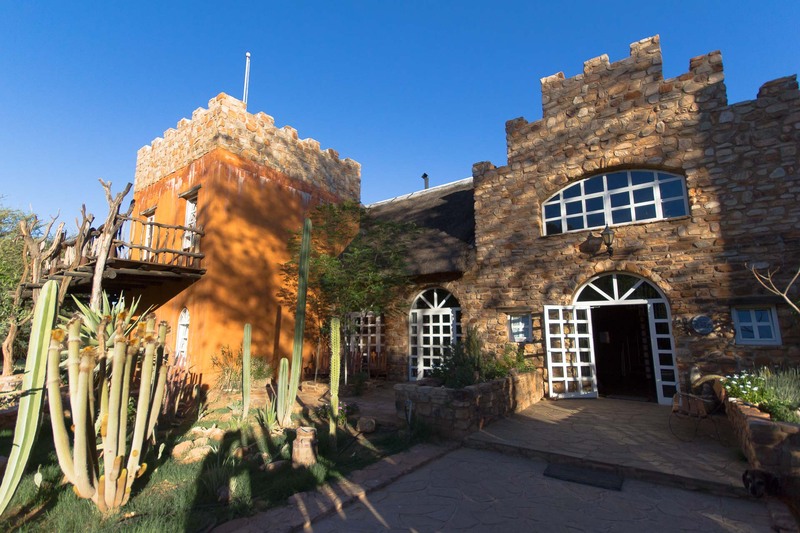 The main building with its four towers are similar to an old castle or Namibian fort – typical South African country style. Five big and comfortable appartments stand at your choice. Some of them are specially designed for families with two separate bedrooms. 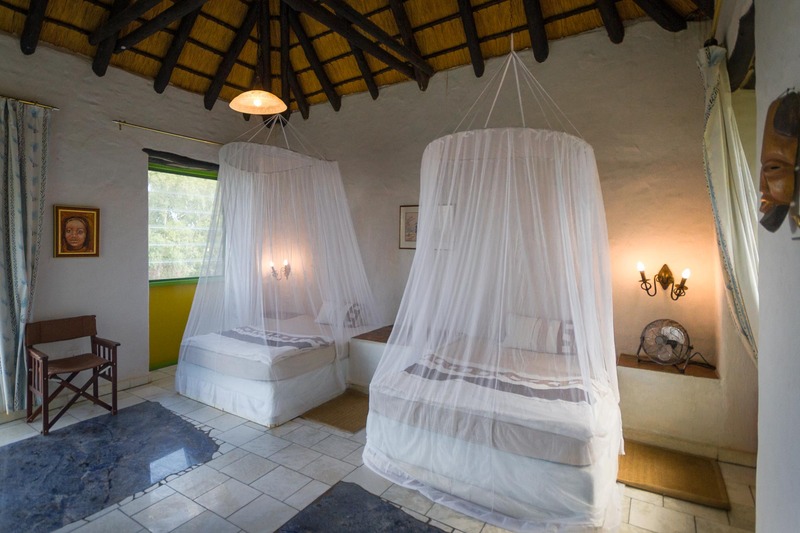 The others are spacious double rooms all furnished in typical Namibian style. All apartments have ensuite bathrooms. Rondavels are typically African bungalows with thatched roofs. 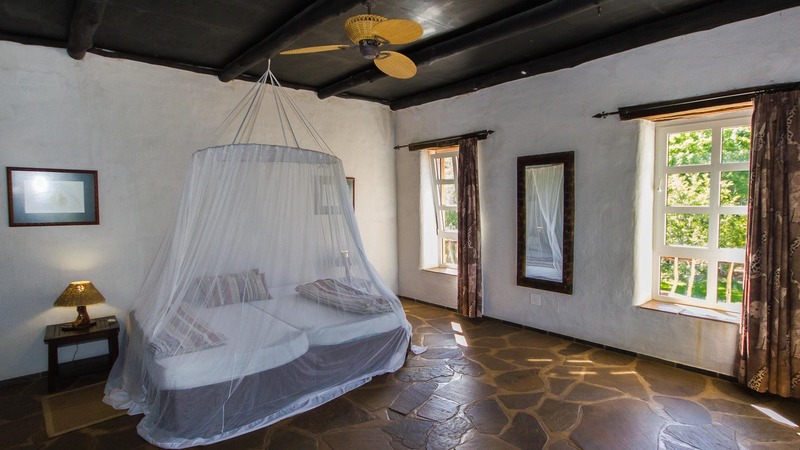 The two rondavels at Okambara are equipped for two people and also have ensuite bathrooms. The bungalows are situated about 100 m from the main building. Above the pool lies the Mountain House with its fantastic view. 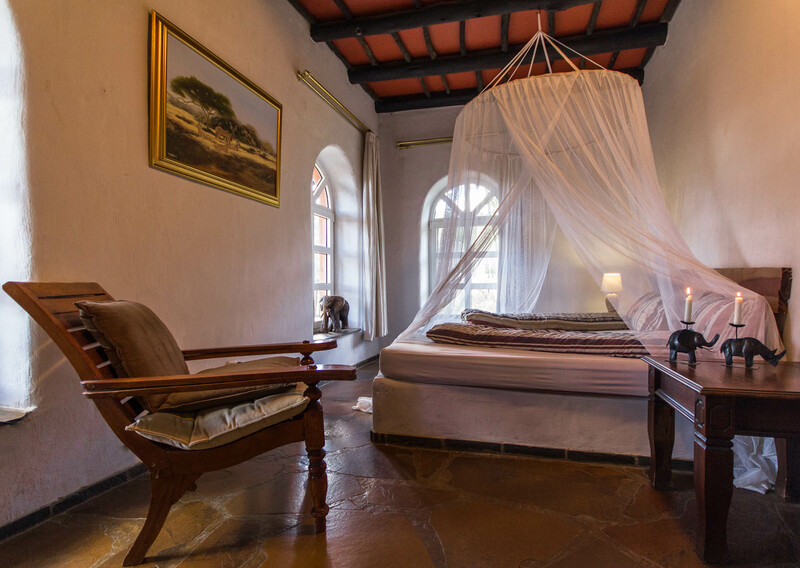 The two rooms with a double bed each and ensuite bathrooms are connected by a spacious lounge. Together with the balcony and the small garden it ist the perfect place to relaxe. Close to the lodge hidden away in the vegetation lies our big pool. Especially during the hot summer it is a very popular place amongst our guests. This ist the place to be if you want to relaxe during the heat of the day! Directly next to the lodge our leopard Lulu who was found abandoned as a cub has his big run. Also 7 Cheetahs have found their home at Okambara due to different reasons as well as two Caracals. Some of the Cheetahs for example come straight from the Cheetah Conservation Fund, others where saved from farms close by where they were supposed to be shot. A special highlight is the daily feeding of these cats prior to the afternoon game drive. A once in a lifetime experience.